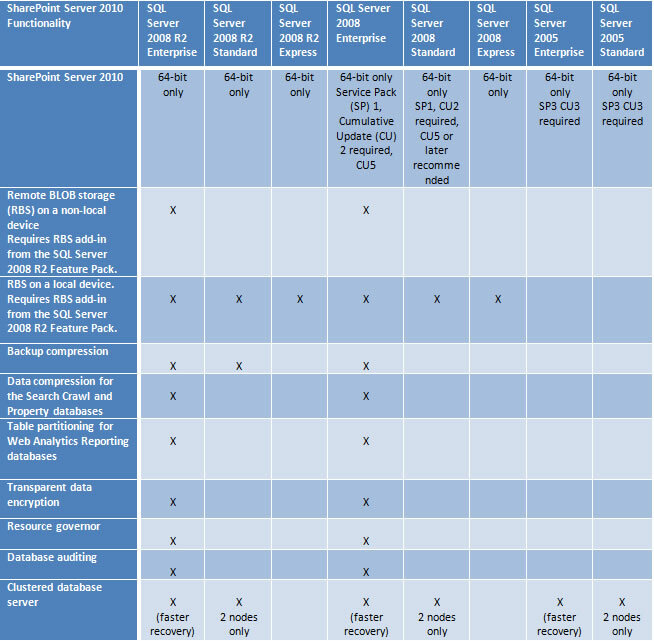 You can use both Sql server 2005 and sql server 2008 with sharepoint 2010 but what are the advantages or disadvantages . Performance and Avaiblity :SQL Server 2008 R2 Enterprise edition enables several dimensions on which it can scale, enabling even the most demanding SharePoint Server 2010 deployments. For example, rapidly growing Enterprise Content Management (ECM) or Web Content Management (WCM) workloads may often require compute resources beyond those associated with traditional collaboration scenarios. SQL Server 2008 R2 Enterprise can support this scenario through a number of improvements, by enabling greater processor scale, the ability to address more physical memory on 64-bit hardware, and hot-add hardware support. Business Continuity Management is a combination of high availability and disaster recovery. High availability ensures a certain absolute degree of operational continuity in the event one or more components fail in an isolated location. Availability requirements are defined by Operating and Service Level Agreements. Disaster recovery ensures a certain absolute degree of operational continuity in the event that all systems fail in one or more locations. Disaster recovery requirements are defined by Operating Level Agreements, Recovery Point, and Recovery Time Objectives. SQL Server 2008 R2 provides a number of native capabilities to enable the design and deployment of a highly available SharePoint Server 2010 deployment including database mirroring, failover clustering, and log shipping. Security: Transparent Data Encryption (TDE) is a feature added in SQL Server 2008 Enterprise that performs real time I/O encryption and decryption of data and log files without requiring unsupported modification of the underlying table schema or increasing the size of the database—that means no changes to SharePoint to enable TDE SQL server audit.Server Audit, which enables tracking and logging events that occur on the system, for example detecting changes or modifications to database objects/stored procedures, surfacing changes to server configuration settings, or detecting changes to audit configuration settings. Better Reporting Services:SharePoint Server 2010 and SQL Server 2008 R2 Enterprise provide close business intelligence capabilities integration through SQL Server Reporting Services. Using SQL Server Reporting Services, administrators can configure reporting servers to enable real-time access to information and control who has access to that information. End users can benefit from this integration by publishing SQL Server reports directly to Document Libraries or by optionally embedding reports in pages hosted on one or more sites in a Microsoft SharePoint Server 2010 deployment. To learn more about Reporting Services in SQL Server 2008 see SQL Server Reporting Services (http://msdn.microsoft.com/en-us/library/ms159106.aspx). Remote Blob Storage is a library API set that is incorporated as an add-on feature pack for Microsoft SQL Server. It can be run on the local server running Microsoft SQL Server 2008 R2, SQL Server 2008,SQL server 2008 express or SQL Server 2008 R2 Express. To run RBS on a remote server, you must be running SQL Server 2008 R2 Enterprise edition. RBS is not supported for Microsoft SQL Server 2005. What is the benefits of RBS ? BLOB data can be stored on less expensive storage devices that are configured to handle simple storage. The administration of the BLOB storage is controlled by a system that is designed specifically to work with BLOB data. Database server resources are freed for database operations. When we consider to use RBS ? The BLOB data files are larger than 256 kilobytes (KB). The BLOB data files are at least 80 KB and the database server is a performance bottleneck. In this case, RBS reduces the both the I/O and processing load on the database server. What is the difference of RBS with FILESTREAM and RBS without FILESTREAM feature ? BLOBs can be kept on commodity storage such as direct-attached storage (DAS) or network attached storage (NAS), as supported by the provider. The FILESTREAM provider is supported by SharePoint Server 2010 when it is used on local hard disk drives only. You cannot use RBS with FILESTREAM on remote storage devices, such as NAS. The following table summarizes FILESTREAM benefits and limitations. 1If the RBS provider that you are using does not support snapshots, you cannot use snapshots for content deployment or backup. 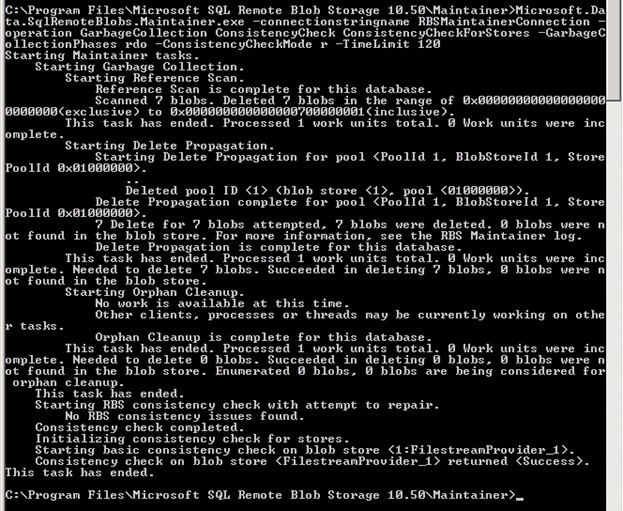 For example, the SQL FILESTREAM provider does not support snapshots. What is the Prerequistes ? If you plan to store BLOB data in an RBS store that differs from your SharePoint Server 2010 content databases, you must run SQL Server 2008 with SP1 and Cumulative Update 2. This is true for all RBS providers. RBS does not enable any kind of direct access to any files that are stored in Microsoft SharePoint 2010 Products. All access must occur by using SharePoint 2010 Products only. If you are storing many small (less than 256 KB) files that are frequently accessed by many users, you might experience increased latency on sites that have many small files that are stored in RBS. Increased latency is one cost factor that you should consider when you evaluate RBS for your storage solution. However, it is unlikely to be the strongest consideration. The amount of increased latency is also related to the RBS provider that you use. RBS can be run on the local server running Microsoft SQL Server 2008 R2, SQL Server 2008 or SQL Server 2008 R2 Express. To run RBS on a remote server, you must be running SQL Server 2008 R2 Enterprise edition. SharePoint Server 2010 requires you to use the version of RBS that is included with the SQL Server Remote BLOB Store installation package from the Feature Pack for Microsoft SQL Server 2008 R2. Earlier versions of RBS will not work with SharePoint Server 2010. 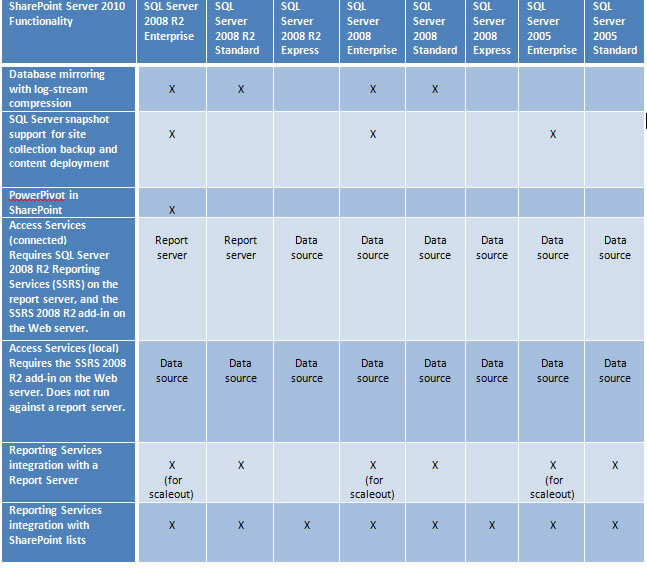 In addition, RBS is not supported in SQL Server 2005. WARNING:We do not recommend that you install RBS by running the RBS_X64.msi file and launching the Install SQL Remote BLOB Storage wizard. The wizard configures the RBS Maintainer to run a scheduled task every 30 days. This setting might not be optimal for your environment. For more information about the RBS Maintainer, see the SQL Server Help documentation that is included with the SQL Server Remote BLOB Store installation package from the Feature Pack for Microsoft SQL Server 2008 R2. (ref : Install and configure Remote BLOB Storage (RBS) with the FILESTREAM provider (SharePoint Server 2010))UPDATE 18.04.2011: With new version RBS.msi you can use GUI interface to install rbs to your envoriment. This is the only provider that Sharepoint Server 2010 with version 10.50.xxxx (R2) .But you can load this provider to SQL Server 2008 express loaded machine. You can allow only big files to be put into FILESTREAM. Since FILESTREAM performance is not as good as the databases when it deals with small files (for example, <1M), you can change this threshold. The following Windows PowerShell command change the setting to 1M (1048576 bytes), file below 1M will be stored in DB. It would be good to test the performance based on your own storage and hardware. Install and configure Remote BLOB Storage (RBS) with the FILESTREAM provider (SharePoint Server 2010). Install and configure Remote BLOB Storage (RBS) without the FILESTREAM provider (SharePoint Server 2010).